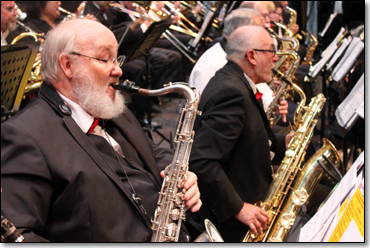 Patrick Arnold, plays saxophone in the Ontario Chaffey Community Show Band and is a Chaffey High School graduate who played in the CHS Tiger Band under the direction of R. Jack Mercer, the founder of the Show Band. He went to Chaffey Community College studying music theory with Joyce Shannon (who taught Frank Zappa) receiving an AA in music. Patrick then played professionally before returning to finish his BA in music at California State Polytechnic University Pomona, studying composition with Philip Browne, Jazz with John Defoe, and saxophone with Dr. James Mooney. In the late 1960's and '70's Patrick played in several Rock n Roll bands including "Race" (Rhythm & Blues cover band), "Beginnings End", and "A Sure Thing" playing in clubs on the west coast from Vancouver BC to Hawaii and as far east as Chicago. Patrick, also known as "PT," has recently retired after teaching music at the high school level for almost 39 years. He has taught locally in the Chaffey Union High School District teaching at Upland, Alta Loma, and Chaffey high schools. He replaced Dr. Petrocelli as band director at Alta Loma when Dr. Petrocelli became an assistant principal. 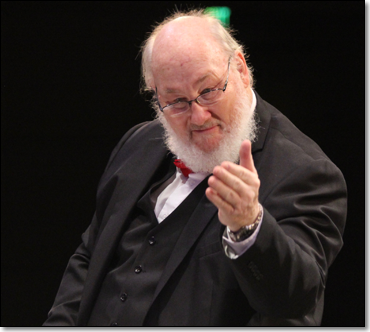 While at Alta Loma Patrick had the opportunity to study Conducting with Dr. Frederic Fennell. 1994 he and his wife moved to Washington State where he taught at Lake Stevens HS. In 2006 he returned to southern California and finished his teaching career in the Perris Union High school District. PT is active in his church and plays on the worship team in "Soul Celebration" at Water of Life community church in Fontana. Patrick is also a Prostate Cancer survivor.